At Cornerstone Homes, you move into more than just a home — you move into a wonderful world of shiny and new. A NEW home has all the latest and greatest, is more comfortable and healthier, and is built just the way you want and need for years to come. 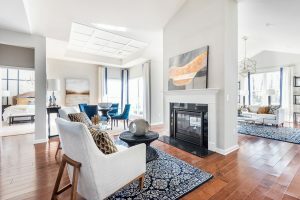 A brand new Cornerstone home in Virginia has all this and more to make your new and exciting milestone as remarkable as can be! There are so many reasons why new is nice, from the ultimate comfort and safety to unlimited luxury and leisure. Let’s explore the reasons why a NEW Cornerstone home will change your life. 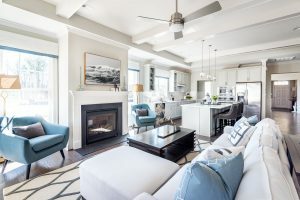 With a wide selection of options, from distinctive design features to customized flex spaces, you can customize your home from top to bottom to suit your lifestyle. 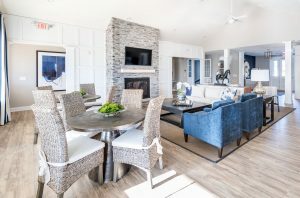 A variety of floor plans provide flexibility, such as room location and size, but each one offers the comfort and convenience of brand new features and construction. Enjoy today’s modern conveniences and designs, like the casual open living concept where your great room is open to the kitchen and dining room, abundant natural light, a romantic gas fireplace, sleek stainless steel appliances, vaulted, tray and 9-foot ceilings, new hardwood flooring, walk-up stairs to the attic for easy storage, and so much more. A new home is a home that’s all about you. And the best part, no one else has ever lived there! Energy efficiency in homes once seemed like a fad, but today, it’s exactly what homeowners want and need. Because your well-being is our number one priority, we utilize only the best up-to-date construction methods to build our homes, which promote a high-quality lifestyle along with high efficiency. Thoughtfully designed and built, our health-conscious living spaces keep you comfortable during every season with better air filtration and airflow, insulation, and more, all while saving you significant money on your energy bills. A more efficient living space makes for an easier and more exciting lifestyle, so you can truly enjoy every moment knowing your home has your back. Living in a brand new home, you can rest assured that every high-quality feature is in its peak state and provides the absolute best service. In addition, if a problem does arise, Cornerstone Homes’ warranty has you covered — click here for more information on what our new home warranty entails. It’s your time to sit back, relax, and enjoy doing what you love the most! Every Cornerstone Home is designed for the future. Built specifically for you to age gracefully while enjoying the present moment, our homes provide invaluable peace of mind. With single-level living, abundant natural lighting, wide hallways and doorways, a zero threshold owner’s entry, easy-open lever door handles, electrical socket night light, grab bars in the bathrooms, and comfort height toilets, your home is already prepared for what’s ahead, so you’ll never have to worry about having to make adjustments as you age. Experience a feeling of serenity and fulfillment like no other in the home of your dreams. This is your time to be FREE! In your new Cornerstone home, it’s never been easier to lead a healthy and carefree lifestyle. From relaxing in your private courtyard or patio, to staying physically fit and active, to fostering friendships and finding personal fulfillment, your home and community are here for you in every way. Our low-maintenance promise ensures that your home is always kept in excellent shape, so you can spend your time doing the things that make you happiest. Venture outside and meet your neighbors for a leisurely walk along the community sidewalks and wooded trails, explore a new passion by joining a club, get some exercise in our well-equipped fitness center, and share meals (and laughter) with friends old and new at the clubhouse. Best of all, you can “lock and leave” your home without a single worry, (we take care of the outside work!!) so that the vacation you’ve always wanted to take will be sweeter than ever. Finally, it’s your time to get out and see the world. We only have one rule for living in a Cornerstone home and community: Be happy and live the way you want. Our new and shiny homes give you every opportunity — and all of the time you need — to do the things you love the most. Say goodbye to stress and worry and hello to a carefree, fun-filled life!